Have you ever encountered times when you saw a marvellous deal overseas but realised you didn't have enough cash? What did you do? Walked away sulkily, trying hard to forget that you ever saw that great deal? Or did you explore other options so you could still bag it home? In this article, I will share the various alternatives and how to proceed with that coveted purchase. You will also learn the pros and cons of each option so as to stretch your dollar when travelling! This is probably the most traditional method that many of us are aware of, especially in the good old days when financial technology wasn't too advanced yet. But before you rush to the nearest ATM to withdraw cash overseas, did you activate your card for overseas use before leaving Singapore? Fortunately, thanks to the proliferation of internet banking apps, you can still activate your card for overseas usage when abroad if you forgot to do so earlier. Check that your card has the Plus or Cirrus logo so that you can use it to withdraw cash from an overseas ATM with the same logo. Do note that additional charges, if any, may be imposed by the foreign bank, beyond the control of the above banks. To minimise the charges imposed on your withdrawal, it's best to withdraw money from the same bank your card is issued, or partner banks that offer free withdrawals. So do your homework before travelling! 2. IS IT BETTER TO JUST USE A CREDIT CARD? With varying types of fees and charges levied on that cash withdrawal at an overseas ATM, you might just want to save all the hassle and use your credit card instead. Wait. Credit cards may give you the spending power without the hassle of carrying around stacks of cash, but the convenience does come at an expense. Regardless of the bank, the card company fees are fixed when you make purchases abroad, but the other 2 charges change based on the bank. All in all, expect to pay about 2.5 per cent to 3.3 per cent in fees when you use your credit card. But if you are using a credit card which rewards you more points or cash rebates for overseas spending compared to spending in Singapore, probably the extra charges don't really matter anymore. 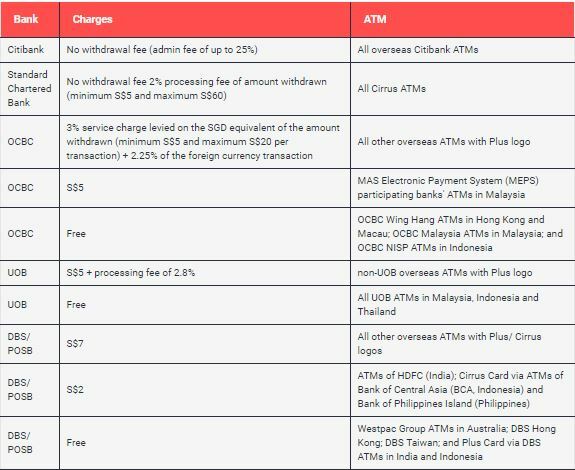 If cash rebates matter most to you, the CIMB Visa Signature and Platinum Mastercard probably appeal most to you with their generous 10 per cent cashback on selected categories of foreign currency transactions. After deducting the additional 3 per cent fee off your purchase, it still works out to be a nett rebate of 7 per cent! The catch: minimum spending of $600 in a month before you are entitled to the cashback, with each category cashback capped at $50 a month. If you prefer rapid miles accumulation, opt for the UOB PRVI Miles American Express Card, which lets you earn top market rates of 1.4 miles per $1 spent locally, 2.4 miles overseas, and 10 miles with major airlines and hotels. Ultimately, whichever credit card you choose, it is always good to ensure it is widely accepted in your travel destination, so it doesn't become a white elephant. Mastercard is believed to have the largest network while American Express is preferred in the United States. So bring the card that best suits your needs and stretches your dollar for your trip! 3. WHAT ABOUT MULTI-CURRENCY WALLETS LIKE YOUTRIP? In recent years, the concept of a multi-currency account (MCA) or travel wallet has caught on with many frequent travellers, particularly the millennials who are more financial and tech savvy. If you are still confused about how it works, read on to understand more. 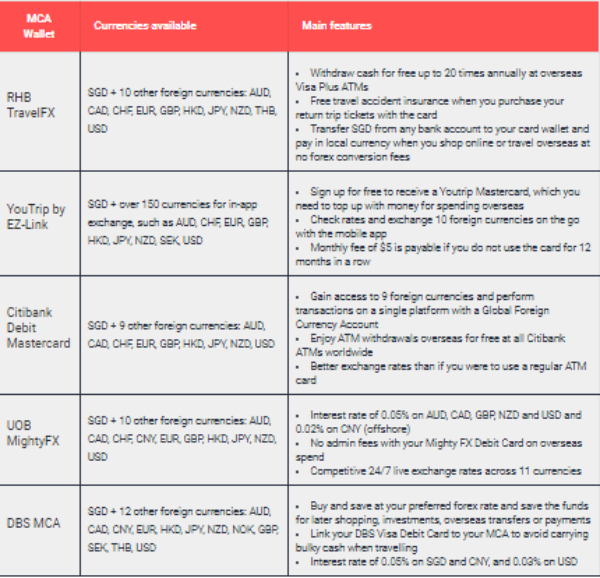 All the above MCA travel wallets work in a similar manner, allowing you to hold several foreign currencies in one single platform for convenience. If you prefer to earn some interest on the cash stored in your account, consider signing up an account with one of the banks. On the other hand, if you travel widely, the YouTrip card may prove to be more useful. YouTrip is especially useful in countries where their currencies aren't accepted by the other accounts or cards, such as Vietnamese Dong or Icelandic króna. 4. So which is the best thing next to cash to bring along when we travel? We have all heard of the age-old saying "Cash is king", but concerns about safety and convenience in carrying huge stacks of cash when travelling are certainly legit. There is no one-size-fits-all solution for a non-cash alternative though, as it boils down to several factors and personal preference. Personally, I will do my homework prior to the trip to confirm which credit card or travel wallet offers the best privileges for my travel destination. Why? So that I can reap the most benefits with a smaller pool of money for a wonderful holiday. What about you? Do share other noteworthy alternatives not listed here so we can all stretch our travel budget!